These images, taken by NASA's Hubble Space Telescope, show an arc of blue light behind an extremely massive cluster of galaxies, called IDCS J1426.5+3508, which is located 10 billion light-years away. The most massive faraway cluster of galaxies has been found, thanks to a fortuitous astrophysical alignment that helped astronomers detect the mammoth grouping. The galaxy cluster, named IDCS J1426.5+3508, is located a staggering 10 billion light-years away from Earth, and researchers spotted the behemoth because its gravitational field is so strong that it is warping the light coming from a galaxy behind it. Galaxy clusters are the most massive structures in our universe, and are made up of hundreds to thousands of galaxies that are bound together by gravity. "When I first saw it, I kept staring at it, thinking it would go away," study lead author Anthony Gonzalez, an astronomer at the University of Florida in Gainesville, said in a statement. "The galaxy behind the cluster is a typical run-of-the-mill galaxy with a lot of young stars, but the galaxy cluster in front of it is a whopper for that range. However, it's really the way that the two systems are lined up that makes the occurrence truly remarkable." This fluke alignment created what's called a gravitational lens, which occurs when a massive object, such as a black hole or galaxy cluster, lies directly between an observer (or telescope), and a more distant target in the background. The powerful gravitational force of the object in the foreground warps the light being emitted by the more distant target, bending and twisting it on its path to the telescope. Gravitational lensing from the faraway galaxy has never been observed behind a cluster at such an enormous distance, the researchers said. Still, finding this galaxy cluster represents a serendipitous astrophysical discovery in itself, since the astronomers were scanning only a small 9-square degree section of the sky. For comparison, if you extend your arm in front of you and hold up your index finger, you will be covering approximately 1 square degree of the sky with your finger, Gonzalez explained. "So finding a massive cluster at that range that is also gravitationally lensing is a real long shot, even if you were looking at the whole sky," he said. 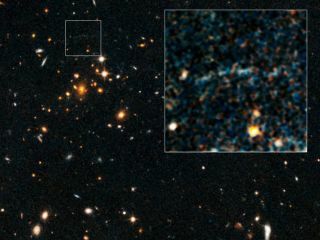 The astronomers originally found the galaxy cluster using NASA's infrared Spitzer Space Telescope, but evidence of the gravitational lensing was seen in images taken by the Hubble Space Telescope in 2010. To follow up on this find, and to narrow down the cluster's mass and distance, the researchers used data from the Combined Array for Research in Millimeter-wave Astronomy (CARMA) radio telescope in the Inyo Mountains in California, and NASA's Chandra X-ray Observatory in space. The discovery of a massive galaxy cluster at such a great distance, in a limited field of observation, could indicate that current models of clusters in the early universe may need to be reworked, Gonzalez said. But right now, it is too soon to tell. "We just don't know," Gonzalez said. "We need to find more clusters at this range so that we can get more data. So far we only have one example to study." The study's detailed findings are published in the July 10 issue of The Astrophysical Journal.